"These unique hobbles designed by Craig are made out of the highest quality, soft cotton rope. 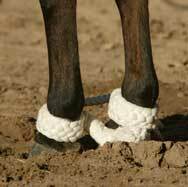 The hobbles are then hand-braided into a wide, durable 4" platt to help prevent chafing or crippling a horse while hobble-breaking. Another must for your tack collection. " "I love to hobble my horses. I feel it gives them a whole new attitude and humility. I purchased a set of your cotton training hobbles last year and I just have to tell you how much I LOVE THEM! They are so soft and have never injured any horse I have put them on! I always have a good knife on me when I am hobble training and I have never had to cut them off! Thank you for such a wonderful, safe, product!"